When the opportunity arose to chat to Ally, the lady behind SML, I jumped at the chance so in a twist on previous introductory posts, here's a little Q&A we did. You're open about your struggles to lose weight. What was your motivation for working in the weight loss industry? How has it helped you personally? For nearly all of my adult life I have been overweight and have struggled like many women do with weight loss. I have been a typical yo-yo dieter and if I’m being honest, had moments where I’ve been in despair over my size. At my heaviest I was a size 20/22 and I became abit of a recluse due to my size. I have PCOS and struggle with the symptoms but also found at the time that I didn’t know how to truly diet or eat healthily. 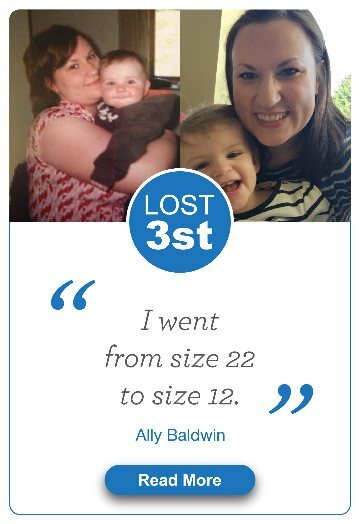 I started working in the weight loss industry through a company called Lighterlife. I achieved great success with them and ended up working for them as a weight management counsellor. I worked with Lighterlife for over 6 years and really enjoyed my job. It was brilliant seeing my clients lose weight and have wow moments (as I call them). Whilst working for LighterLife, I decided to embark on a counselling course as I wanted to be able to support my clients in further detail. It was during my training as a counsellor (when we have to undergo self evaluation), that I personally realised why it was that I had come to be overweight and more importantly why I had yo-yo’d as a slimmer. Tell us a little about SML and how it came about. In 2012 I felt I wasn’t getting the right work/life balance. My son was growing up and I was working evenings and not spending any time with him. I felt that my time with LighterLife was naturally drawing to a close yet I still wanted to work in the weight loss industry as I was so passionate about helping others change. So I set up the SML Diet. I contacted manufacturers and unfortunately had a lot of closed doors due to me being such a small business. However, I was determined not to give up. I wanted SML Diet to have the meal replacements to help slimmers lose weight and I didn’t want SML Diet to be another faceless company that just shipped products off to people and left them to it. I wanted my customers to know that they mattered to me. Every order was in fact a person. A person who wanted could probably relate to how I have felt at my worst. I wanted my customers to know that we would always be with them and were here for them no matter what. More importantly, I wanted slimmers to be able to take control of their weight. That’s why I called it SML – Slim and Maintaining for Life as I truly believe with the right attitude we can maintain our weight for life. It was hard getting out there. I was basically all on my own. I had lost the security of a well known company and had to try and get our message out there and I’m so grateful to the customers who gave us the chance to help them lose weight. How does the SML Diet work? SML Diet offers slimmers meal replacements which help them lose weight. It’s known as a Very Low Calorie Diet. In essence, slimmers consume 4 of our meal replacements per day and as it’s little calories and carbohydrates, they burn their stored body fat. Our Meal Replacements contain at least 25% of your recommended RDA for essential vitamins and minerals so you are still getting nourished whilst losing weight. I've seen the term Ketosis used in relation to VLCD, could you explain what it is? Ketosis is an interesting process. It’s a natural state that our bodies go into when we consume little carbohydrates. Basically if we eat under a certain amount of carbohydrates per day, our bodies will naturally go into a ‘state of ketosis’ this means your body gets the energy it needs from your stored fats on your body. So we are still able to function normally as we are getting our energy not only from our calories (in our packs) but also from our fat. That’s why we then lose weight quickly when in ketosis. Like thousands of women I've tried losing weight but end up getting discouraged because weight loss has slowed down. What do you recommend to keep positive and motivated? Weight loss will slow down no matter what diet we embark on. I try to use a clear example for my clients without trying to insult anyone. If you imagine a car (lets say a 4x4). Now this car is bigger than (lets say a smart car) so therefore it will get through more petrol. The same happens with us and our weight loss. The bigger the body mass, the quicker the weight will come off. However, once we start losing, our bodies become smaller and we naturally need less calories in order to maintain our body weight and so the weight loss slows down. It can be dis-heartening when it happens – it’s happened to me. All I can say is don’t concentrate on what the scales say. The scales don’t tell you how amazing you are doing on a day to day basis and they can be really inaccurate depending on lots of different factors. Look at how far you have come – remember how you felt at your worst and remember how you feel now. Get out those before pics and remind yourself that you aren’t that person anymore. I would also advise slimmers to take a good before (front and side) full length pic and regularly (maybe once a week) update them. You don’t see how much you are changing on a day to day basis but those photos will certainly help with motivation. I would also advise slimmers to every day take time to write 3 things that they did that helped them with their diet that day as we are quick to dismiss our positive behaviours (usually because of the way we are programmed as humans). Is it true that losing weight quickly on a VLCD means you end up putting it all back on again just as quick? I hear this a lot and it simply isn’t true. Over the years I have seen people unfortunately put weight on (with any diet not just VLCD or Meal Replacement Plans) and I have also seen those that have successfully maintained. I have been in both categories myself and for me personally I have only gained the weight again as I stopped concentrating on myself. We gain the weight again as we start to become complacent. We let our boundaries slip and before we know it, we have reverted back to our old eating patterns. Science tells us that there’s 3500 calories in 1lb. If we eat more than our bodies need for nutritional purposes, then weight gain is inevitable. Those that manage their weight successfully, usually not only change their eating patterns but also incorporate exercise into their life. It’s not realistic to say ‘I’m not going to eat chocolate again’ or that you must ‘only eat salads’ as that’s not sustainable however, it’s all about finding balance in your life. Once we have the right balance of thinking about ourselves, exercise and food, we will be able to successfully lose and manage our weight. SML have been kind enough to send me enough products for a week on the SML diet in return for my review. So far I'm pleased with how I'm doing and will be sharing once I've completed.